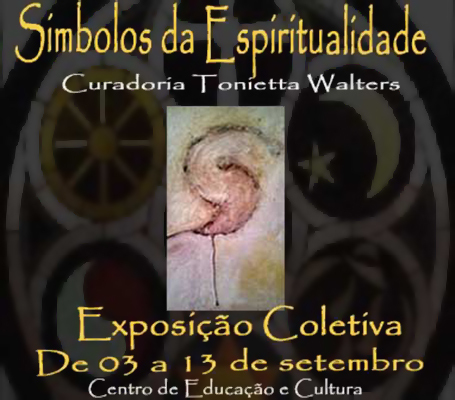 ‘Spiritual Symbols’ was curated by my personal invitation and showcases the work of a range of artists including several master artists of the region. The body of work of an artist is a narrative of the journey of the individual spirit of that artist. Some artists use that journey to create their own symbols or refine their understanding of already existing symbols. The approach to the exhibition takes an ecumenical and syncretic view of “The Spiritual” since whatever road the artist is on for that journey does not necessarily include religion, which represents a different thing altogether than spirituality. In 2010, after over 22 years of painting and almost 12 years of being a “community artist” by curating exhibitions and facilitating artist opportunities or spaces, I had a crisis of faith. Just as the behaviour of some religious people can cause the questioning of religious beliefs, I lost faith in why I do things – the spirit of the artist. It was debilitating so I removed myself from the community. When I finally cracked open my spiritual cocoon and thought of where I could find an artist community that would effectively heal my spirit, the ECCOS Artist Residency in Suzano, SP Brazil came to mind. In this exhibition, I am happy to present both personal work completed during the residency and the work of artists that have renewed my faith in the spirit of the artist, thus the artist community. I am grateful to those artists, the people at ECCOS and… God.